To grasp the strangeness of Jim Harbaugh’s tenure in San Francisco, it helps to consider what people might say 20 years from now, when they stumble onto it for the first time. Imagine the reactions to this historical footnote: A coach with Harbaugh’s résumé — 36 wins in his first three seasons, three consecutive trips to the conference championship, and one loss in the Super Bowl — was gone after just four years on the job. There’s some precedent here. Jimmy Johnson won two championships in Dallas before friction with Jerry Jones sent him on his way. But even Johnson took another NFL job. It wasn’t long ago that Harbaugh could reasonably be considered the most valuable commodity in the NFL. Now, he’s out of the league entirely. Jim Tomsula’s time in charge has already been … eventful. His first on-camera interview as head coach had the beats of a Between Two Ferns episode, only more excruciating. The benefit to Tomsula — a well-respected career assistant with whom GM Trent Baalke is very familiar — is that in some circles, he’s seen as the type of coach who will fall in line behind the team’s general manager and the rest of the front office. It doesn’t take a big leap to understand Baalke’s thinking. Harbaugh did an excellent job with the roster he had in San Francisco, but it was a roster that Scot McCloughan and Baalke filled with more talent than almost any other in football. The construction of the 49ers involved landing a handful of stars at just about every level of the draft, but it also included stockpiling mid-round picks who are finally ready to become a major part of San Francisco’s plan. Any consideration about the Niners’ future starts with how they choose to spend and save money on their own players in the next few weeks. The roster — both players under contract and those hitting free agency — is filled with pressing decisions, and as of today, San Francisco is just $6.52 million under the cap. Without any more cuts, only four teams are heading into free agency with less room. The pending free agency of players like wide receiver Michael Crabtree and guard Mike Iupati didn’t sneak up on Baalke, and his staff have spent the past few drafts combing for players whose draft value was diminished because they wouldn’t have been able to produce immediately. It may be the first season of life without Harbaugh, but for Baalke and the 49ers, 2015 is a pivot season in a plan that goes back years. And how it turns out could determine just how much change we see within the Niners’ roster in the next 12 months. Much of San Francisco’s success during Harbaugh’s reign was a product of the resources it devoted to the lines on both sides of the ball. Now, two of Baalke’s most pressing offseason questions could alter the integrity of both of those groups. At 35 — seriously, a 35-year-old defensive tackle — Justin Smith was still a consistent presence for the Niners defense before slowing down in the final few games of the year. 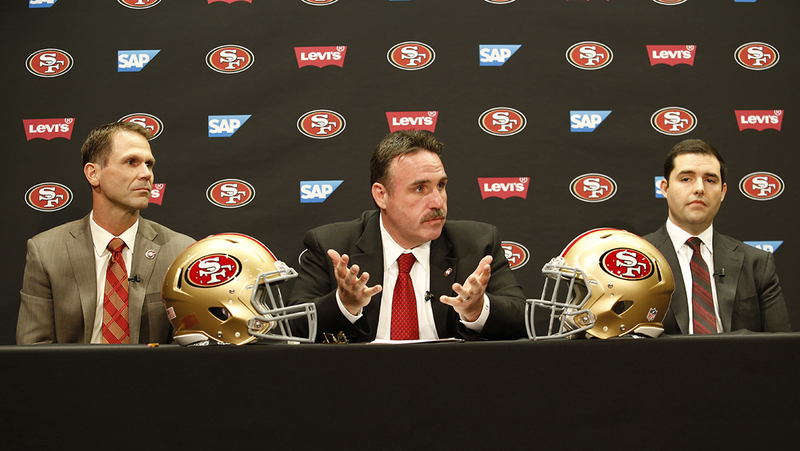 He’s set to meet with Tomsula this week to discuss his future, according to the Sacramento Bee’s Matt Barrows. If Smith does retire, it will save about $4.25 million against the cap, but after cutting Ray McDonald in December, losing Smith would leave San Francisco paper-thin on the interior of its defensive line. The Niners are reportedly meeting with recently cut Darnell Dockett this week, but their best hope to replace Smith’s production would likely be the development of 2013 second-round pick Tank Carradine. Last year was essentially Carradine’s rookie season, after he missed all of 2013 with a knee injury that sent him tumbling in the draft. He saw a little action in the second half of last season, but with both McDonald and Smith gone, his role would likely see a major boost. Brandon Thomas is another player the Niners may be betting on. Coming out of Clemson last year, Thomas was considered one of the top guards in the class, but a torn ACL in April meant he was available in the third round. Unless the Niners address the line early in this year’s draft, Thomas is the logical replacement for Iupati at left guard. With the state of San Francisco’s cap, it’s tough to see them meeting the market for Iupati, who’s likely to get a pile of money from teams needing offensive line help. With his struggles in pass protection, Iupati’s status among guards around the league is occasionally overstated, but he’s still a bruiser — a physical presence that can change the dynamic for any running game. That said, he’s expected to pull in a salary around 10 times what Thomas is set to make next season. If Thomas does land in the starting lineup, he’ll join another 2014 third-round pick, Marcus Martin. Considered by many to be the best center available in last year’s draft, Martin was uneven when given a chance to start late in the season. It’s reasonable to believe he’ll improve in Year 2, and the Niners need him to. When San Francisco’s offense was clicking over the past few seasons, it was because the offensive line was dominating. That group slipped a bit last season, for a handful of reasons. Right tackle Anthony Davis missed most of the year, Alex Boone struggled to find his footing early in the season after holding out in training camp, and the constant shuffling deprived San Francisco of the continuity it enjoyed for almost all of 2012 and 2013. Even if Thomas does develop into a high-quality guard over the long term, he’s unlikely to add what Iupati did, individually, in his first year. But as a group, San Francisco’s line has a chance to be better than it was last year simply by staying healthy. Frank Gore’s future is very much in question, but if a group of Joe Staley, Thomas, Martin, Boone, and Anthony Davis can play most of the season together, this is an offense that should still be able to build itself on a steady running game, no matter who’s carrying the ball. Running back Carlos Hyde looked like he was getting shot out of a cannon at times last year. As much as or more than Iupati, Mike Solari may turn out to be the guy the Niners miss most next year. The longtime offensive line coach spent the past five years in San Francisco, which was just the latest spot where he’s had a line filled with Pro Bowl players. He and Harbaugh are not the only coaches the team will miss. Last season might have been Vic Fangio’s best as San Francisco’s defensive coordinator — and that’s saying something. The Niners were among the best defensive teams in the league during each of Fangio’s four seasons, but last year, they managed to finish fifth in defensive DVOA without full seasons from their defense’s three biggest stars: Patrick Willis, NaVorro Bowman, and Aldon Smith. Fangio, who’s off to Chicago, obviously won’t be back this season, but Baalke hinted at the combine that both Willis and Bowman will be. That’s not a surprise. Most of Willis’s $8.27 million cap hit is made up of base salary and can be converted to bonus money to create space, and there’s no financial upside to losing Bowman. We’re also just a year removed from these two being the consensus top linebacking duo in football. People suggesting it’s time to roll with Chris Borland and cut ties with Willis — the best linebacker of his generation, who just turned 30 — might want to slow down. Borland was superhuman at times during his rookie season, but as we saw last year, depth is always a virtue on an NFL roster. The position that could actually be in flux is outside linebacker. Ahmad Brooks is slated to make more than $7 million this year; that’s a big price tag for a player who didn’t add much as a pass-rusher last year. Dan Skuta, who has spent much of the past two seasons filling in for Aldon Smith, is a free agent. If San Francisco does start the season without Brooks and Skuta, it’ll mean an even more substantial role for Aaron Lynch, who was San Francisco’s most productive edge rusher as a fifth-round rookie. Lynch was a high school All-American who had a productive freshman year at Notre Dame before transferring to South Florida. His talent was never in question, and as a rookie, it looked like he might turn into another low-risk steal pushed down the draft because of concerns about his personality. For Aldon Smith, that type of concern crept up later on, but as he heads into the final year of his rookie deal, the deadline is coming for the Niners to figure out their plan for him long-term. Smith wasn’t quite himself in the seven games he played last season, but considering what he was for his first three years in the league, it’s reasonable to expect San Francisco to give him every chance to show the team he’s that player. As a whole, San Francisco’s pass rush was one reason the Niners were able to surprise on defense last year without their stars. They got pressure on 27.3 percent of opponents’ dropbacks — the ninth-best rate in the league — while blitzing only 21.5 percent of the time. Only four teams sent five or more rushers at a lower rate. An engaged Aldon Smith and more Lynch could mean a lot of pass-rushing success on the edge, but if the Niners do start the season without both McDonald and Justin Smith, they’ll need some defensive line help that goes beyond Carradine’s expanded role. That help may come as early as the first round, when a few players who fit the bill as ends in Eric Mangini’s 3-4 defense might be available. Cornerback is another spot where San Francisco could use an upgrade, despite the strength of the team’s pass defense a year ago. The Niners somehow finished fourth in pass-defense DVOA. Some of that is Antoine Bethea coming in and playing great in his first season with the team, but some of it is probably Fangio being a sorcerer. With or without some more talent on the outside, Mangini is going to need to replicate some of that sorcery if the 49ers are going to stay afloat in the NFC West. Even with some of the shuffling on defense, it’s by far the more stable side of the ball for San Francisco. After last season, the structure of Colin Kaepernick’s deal looks even smarter than it did when he first signed. 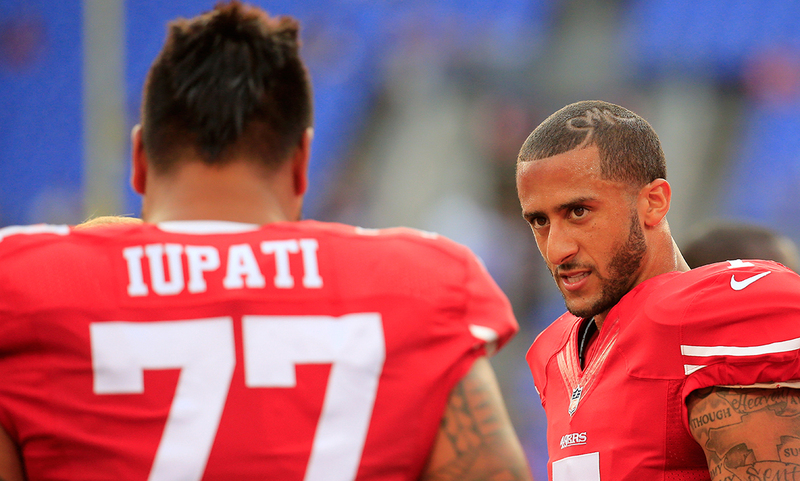 In year three as a starter, Kaepernick took a significant step backward. He finished the season 19th in QBR — barely ahead of Ryan Fitzpatrick and Andy Dalton — after landing in the top 10 in both 2012 and 2013.1 Entering the season, Kaepernick seemed poised for his best season ever as a passer. Michael Crabtree was starting the season healthy, the Niners had traded for Stevie Johnson, and, along with Anquan Boldin and Vernon Davis, Kaepernick had his scariest set of weapons yet. As it turned out, Davis spent most of the year hurt and Crabtree turned in a painfully mediocre season. Considering Kaepernick’s struggles and their success on the ground last year, it makes sense that the new 49ers staff has outlined a run-heavy approach from new offensive coordinator Geep Chryst, but parts of the passing game still need addressing. Stevie Johnson is a logical cap casualty, with his $6 million, non-guaranteed salary, but if the Niners do let him go, there’s a chance they’ll be without both him and Crabtree at the start of next year. Either in free agency or the draft, receiver is an immediate need, and he’ll need to be one with the ability to take the top off a defense. Speed was nowhere to be found in last year’s group, and it showed in how San Francisco was able to attack opposing defenses. On throws outside the numbers, 20 or more yards down the field, only the Chiefs had a worse QBR. A healthy Vernon Davis would go a long way for Kaepernick, but even with his tight end back, San Francisco still needs another element on the outside. Putting together a receiving corps with a more diverse set of strengths would be one of the first steps in determining Kaepernick’s future. With the amount of talent the Niners are bringing back defensively, rolling with Kaepernick this season is the shrewd choice. Depending on how the season plays out, next offseason is when Baalke will have a decision to make. Kaepernick’s cap figure next year is about $16.8 million, and the Niners could save about $9.4 million on their 2016 cap by letting him go. If San Francisco takes a nosedive this season, next spring would be a perfect time to hit the reset button all over its roster. 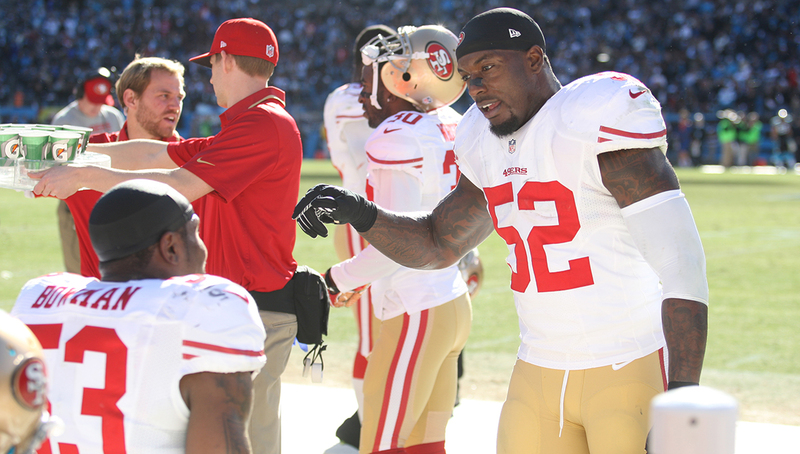 Virtually all of Willis’s $9.6 million is non-guaranteed, and both Aldon Smith and Vernon Davis will be free agents. In an ideal world for Baalke, Smith returns to his 2012 self, Willis and Bowman come back healthy, the offensive line and running game come back to form, and this season just becomes the next one in the plan the front office started to lay out five years ago. On the other hand, it’s not hard to imagine a year in which it all goes the other way. Either way, what happens in 2015 will define how we view the Niners’ decision to live in a world without Jim Harbaugh. Among quarterbacks with at least 200 attempts.